Now Fiskar makes some cool stuff but a lawn mower, hey at lest it must be sharp. The Fiskars® Momentum™ mower combines patent pending technology with superior ergonomics to deliver a reel mower with best in class cutting performance for a superior mowing experience. InertiaDrive™ Technology: Combines a large diameter cutting reel and heavy blades to store energy (like a flywheel) until a burst of extra cutting power is needed. • 2X More Cutting Power: Delivers twice the energy to power through small twigs, weeds, or dense grass that would jam other reel mowers. • 30% Easier to Push: Advanced technologies reduce cutting system friction, provide optimal blade positioning and deliver extra cutting power to reduce push force by 30% in long grass. StaySharp™ Cutting System: Precision engineered to cut grass without the blades touching – greatly reducing friction & blade wear. • Long Lasting Performance: Delivers enduring performance without the need for annual sharpening by cutting grass without the steel-on-steel contact that dulls standard reel mowers. • Best in Class Warranty: 4-year warranty is longer than any other reel mower warranty. VersaCut™ Design: Positions the cutting reel forward and uses a long wheel base to provide maximum cutting versatility. • Greatest Cut Range (1” to 4”): Delivers the greatest cut range of any reel mower – with cut height settings from 1” to 4”. The 4” maximum cut height is vital when you miss a week of mowing. • Closest Side Edging: Edges three times closer than other reel mowers & never leaves uncut strips under the wheels. Might not classify as full blown exercise but push mowing any lawn will do the trick. Hey it seem Las Vegas is good for something other than Biking. Jump off a casino, no not after you loose your life savings, after you pony up $99 and 30 min of your life. The Skyjump is the highest commercial decelerated descent, the SkyJump takes thrill-seekers on an 855-foot "controlled free-fall" at 40mph - think base jumping, but with a safety wire. Hey I guess there are worse things to spend your money on in Vegas. So we all would like to have one, the expense is something completely different. You could take a old TREO 610 apart and use the video camera in that. IN the case that you can't use one of your old devices the X170 is a suitable device. The X170 Action Camera is the newest all-around helmet camera with everything that you need to capture your extreme sports videos and photos! It offers high quality video (720 x 480 pixel), 5 mega pixel photos, a 1.5" colour LCD screen for playback, a 5m wireless RF remote control, a 170° wide angle lens, which can be rotated through 300°, and much more! The X170 is easily mounted onto your head, goggles, helmet, handlebars or just about anything with the wide range of mounts included in the box. Once mounted, the lens can be rotated through 300º into the perfect position to ensure an upright picture. Now that you’re ready to go simply use the wireless remote control to start and stop your videos or to take photos. Alternatively recording can also be started and stopped directly from the camera. Once you’ve captured your on-board video and photos you can easily play them back or view them on the built-in colour LCD screen to show your friends or for training purposes. Play it onto a TV with the AV cable or download easily to your computer with the USB cable, both of which are included with the X170. Dropped your phone in a sink, toilet, puddle, river rapids, or off your boat the Dry-All might be able to save it. A bag a rice can help but having a couple of these babies around can't hurt. DRY-ALL is one of the most effective drying agents (desiccant) in existence. It is not a silica gel. DRY-ALL is a mixture of indicating blue beads and stationary white beads. When all of the beads have turned white/tan they have absorbed all the moisture they can hold. @ $10 dollars a bag it sure seems worth it if you can save your iPhone. iPocketWallet - Best iPhone Wallet Case. This is by far the best idea for the iPhone/Blackberry! If you read through most of the reviews they are favorable and some even offer improvements but why, hook up a Bluetooth headset and you are good. if you want to surf take it our of your pocket. You could also poke a small hole through the top and plug your headset in, problem solved. The only thing that could be added is a money click on the outside, hey I have needs too. A product that doubles as a wallet and carrying case for the iPhone is here. The iPocketWallet is a new product for current iPhone users who have been longing for a way to carry around their money, credit cards, and iPhone all in one convenient package. All of the current iPhone cases on the market are suffering from one problem, BULKINESS. These products are all composed of thick leather, belt clips, and buckles. This type of packaging defeats the purpose of buying a phone that was manufactured and intended to be less than half an inch wide! iPocketWallet solves this problem by providing its owner with a comfortable wallet that fits easily inside your pants pocket. Having a pad on the outside of the glove is cool and helpful when bashing through the trees. High caliber glove for the serious contender. Carbon fiber 3rd and 4th knuckle for low profile protection. Carbon kevlar palm patch for extra protection. Cotton terry thumb for sweat absorption. So here is a company that seems to be pushing the compression boundaries to help individuals with joint problems, hey why not weave the support into the product if you can. That is what Opedix is trying to do, reduce pain, increase joint function and joint stability. Opedix is Evidence Based Apparel®. Our running tights, posture shirts and ski/snowboard tights are proven, through scientific studies, to improve joint alignment in the knees and shoulders. This can increase stability and strength while also reducing wear and tear by 'unloading' the joints. Using proprietary fabrics designed specifically for comfort and support, the Opedix Knee Support System utilizes a patent-pending anchor and sling design to provide support to the outside of the knee, which reduces the amount of damaging outward movement and decreases the stresses or “load” on the knee joint. Simple, give designer Jaeseok Han a million buck right now. He point out the obvious and easy solution that millions of us wish we had as a back up, either in the streets of NYC or in a jungle. And you’re lost in the jungles…deep forest where GPS doesn’t work and you are stupid enough to leave your satellite phone at home! 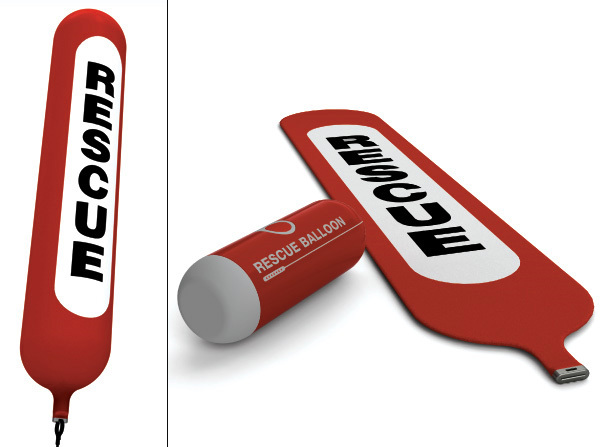 Aren’t you glad that you packed the “Rescue Balloon Kit” in your backpack? 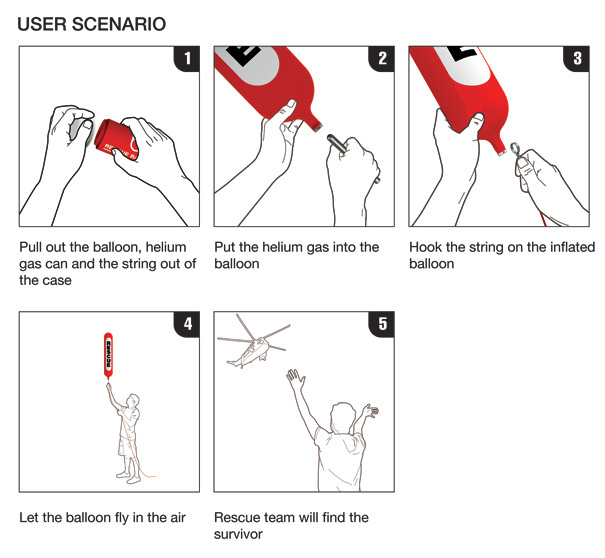 The handy kit contains a helium gas cylinder and a long string balloon. Fill it, seal and send it skywards. When you’re missing and rescue mission is on, hopefully this red tube will get spotted, hovering above the dense foliage. This can be sold many different ways depending on where you live and where you are going. have a nice stash of some Paracord 100 feet $7 dollars at Cabela's. Minnesota's first mountain bike trail accessible to disabled people on three-wheeled hand cycles will be built later this year at Elm Creek Park Reserve in Maple Grove. Advocates for the trail expect it to be an especially popular recreation outlet for injured veterans. "I look around and see our veterans coming back with missing arms and legs, and these guys don't want to be handicapped, they don't want to stop doing things with their kids -- why not give them an opportunity?" said Tim Wegner of Rosemount, an off-road cyclist and professional trail builder. If hand cyclists respond with enthusiasm, other dirt trails could be widened for accessible use, too, he said. The accessible trail will be a 1- to 2-mile loop in a 12-mile dirt trail that the Three Rivers Park District plans to begin building this fall and open June 2011. The $305,000 trail will be built with $90,000 from the state's Parks and Trails Legacy Grant Program and $50,000 from the Federal Recreational Trail Program. Make your hike through the Alps, tundra or desert become a fulfilling experience. The MONOWALKER contributes to it. Due to the smart geometry, you only carry half of the weight of your equipment on your hips, without missing out on comfort and supplies. There is not going to be any weight on shoulder or neck. Because all the remaining weight is on the back wheel, your hike becomes much more relaxing. If you want to stop, in order to take a deep breath, you can relax and just lean back because the disk brakes will hold you and the baggage. MONOWALKER follows you, wherever you want to go to. You are not restricted in moving while pulling it, because the MONOWALKER has a special hipbelt. Therefore, one-sided impact on shoulders, neck or back diminishes. Additionally, by going uphill and downhill, your knees become released, because you are carrying only half the weight of your equipment. On downhill routes, the brakes help you, because you can choose to pull the disk brake, so that it makes the trailer move slow constantly. The MONOWALKER trailer follows you through all terrain. We have not found one trail in the Alps that would have been impossible to pass for the trailer; singletrails, screes, rooted trails- MONOWALKER follows you. When the trail becomes a fixed rope route, the MONOWALKER can be used as backpack, with an effort of just seconds. The substructure of the trailer and the handlebar need to come off, and the “harness” connects with the main frame. Eventually, the major weight will be supported by the hipbelt. Therefore, even very heavy equipment can be carried.